Tallová’s work is at the crossroads of various media. She works on photographs and objects that she assembles and deploys in space. The manipulations and themes she approaches create a new link, both material and poetic, between the elements on display. 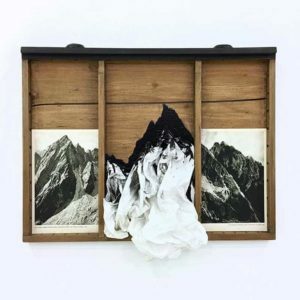 Her installations always respond to a common methodology: objects, paintings, old photographs, collages and albums are meticulously arranged on a system of wooden shelves. Far from being a simple support, these structures determine each composition. The protocol is rigorously applied to each intervention while responding to different spatial constraints: new forms are born according to the characteristics of the environment. Lucia Tallová was born in 1985 in Bratislava (Slovakia). She lives and works in Bratislava. She is a leading figure of the emergent Slovakian art scene. Born 1985 in Bratislava, Slovakia. Lives and works in Bratislava.